The acclaimed JA Beach Hotel, previously JA Jebel Ali, features over 200 rooms and suites with private balconies overlooking the Arabian Gulf, private marina, and hotel gardens producing the best views of Dubai. The 5* resort also has an incredible selection of facilities including a golf course, 14 restaurants and bars, multiple swimming pools and spa facilities to kick back and relax. The Resort Golf Course at the magnificent JA Beach Resort may only have nine holes, but it is a genuine championship standard layout, with dramatic holes that are both beautiful and challenging. The resort is also situated in the perfect location to explore the city and play some of the other popular golf courses in Dubai. At its peak the Resort is 3,299 yards, and has been used as a warm up for the curtain-raising Dubai Desert Classic. Around the central saltwater lake that affects five separate holes, the estate is peppered with exotic trees, shrubs and plants, which help to create the resort's oasis atmosphere. 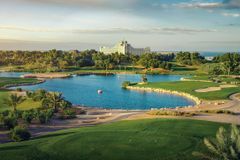 While the native peacocks wander by, golfers will enjoy views of the Arabian Gulf from a course that really typifies the extravagance and beauty of golf in Dubai. The resort's fringe is bordered by an 800 metre long private beach, allowing guests direct access to the pure sand and clear water of the Gulf Coast. The hotel itself is surrounded by 128 acres of exotic gardens and the championship standard golf course, and offers 260 rooms and suites, spread across five floors. Every room features a private balcony, air-conditioning, satellite television, mini-bar, safe deposit box and tea/coffee making facilities. For the genuine Gulf experience, upgrade to one of the amazing Sea View rooms. The JA Beach Resort has outstanding facilities, and with the on-site golf course, it is one of Dubai's most comprehensive holiday destinations, suited perfectly to the needs of families and groups in particular. The sun terraces around Jebel Ali's three swimming pools are the place to enjoy the searing Dubai sunshine, while you can also play squash, tennis and badminton. Relax in the sauna, work out in the fitness centre, or have a go at camel riding, jet skiing, wind surfing, sailing or deep sea fishing. For those in need of pampering, the resort offers a range of relaxing treatments in the Palm Tree Courtyard Spa. Of Jebel Ali's four restaurants, Signatures is a French fine dining experience, while the White Orchid is an elegant Far Eastern gourmet experience.